My hubby’s mom is Finnish. Her parents literally came over to America on a boat from Finland. When I met my hubby’s parents for the first time, they made Pannukakku for breakfast. It was so fun having her teach me how to make this and it was surprisingly easy. One of my favorite memories with them was the weekend I spent meeting them in Chicago. I was seriously amazed at how delicious this pancake was. It is hard to describe a finnish pancake. Basically if a crepe, a custard, a pancake and french toast had a baby, this would be it! Doesn’t that just sound amazing?? All of your favorite things rolled up into one! My hubby’s mom would make him these pancakes every year on his birthday. So guess who just had a birthday? The hubs. But this birthday was a little more special than the rest. He turned 30!! I had to make him pannukakku of course and then completely surprised him with a getaway to a resort, snow tubing, a nixon watch, and the best tickets that I could buy to the Avalance vs Blackhawks game in Denver! Woot woot! I am a great wife like that. We had such a fun day together. I am so glad that after a year of asking his mom for the recipe to this that I finally got my hands on it! This is one delicious pancake! Review: These are so excellent and easy. You probably have all of the ingredients on hand and ready to make. You can serve them up with fresh fruit on top, whip cream, syrup, or even some jam. I also served it with peppered bacon and found a new and delicious technique to make them in the oven. I will never make bacon on the stove again! This is a favorite family recipe that we will be making again and again! 1. Preheat the oven to 400. Place the butter in a 9×13 and put into the oven to melt and become slightly bubbly. 2. Whisk together (I do this in my kitchenaid) the 4 eggs until combined. 3. Add the flour, milk, salt, and sugar. Blend together until batter is thin. 4. Pull the pan out of the oven with the melted butter that is slightly bubbly. 5. Gently and slowly, pour the batter on top of the melted butter. 6. Cook for 30 minutes. When it is done, it will be golden brown around the edges and bubble up especially over the sides. 3. Place the bacon laying side by side on top of the aluminum foil. 4. Bake about 15-20 minutes or until desired crispness. 5. Once done, transfer to paper towels so that the excess grease can drain. Look at how much fun I had reminding my cute hubby that he is 30! I did buy him over the hill decorations. Except now I think over the hill is at least 60 these days! Oh yum. I make German pancakes which look similar and they are so good. Happy Birthday to the hubs! You did awesome with the gifts! I stumbled upon your recipe on Pinterest and it is in the oven as I type this. I cannot wait to try them! These were pretty good but I think I like regular German pancakes better. They have all the same ingredients, just different proportions. I found this on Pinterest, and we tried this last night and it was wonderful! Added in a splash of vanilla which was also great for an extra subtle flavor! Will definitely be making this again, thanks for a great recipe! I am 3rd generation off the boat from Finland. We grew up eating these!!! Cherry pie filling and powdered sugar are the best! My mom would put butter and syrup on hers. Can u leave the batter overnight? Like if I made the batter one night and then in the morning I tossed it all together and baked it? I wish these recipes would give the carbs, etc. as my husband is diabetic and it is really hard to control his carbs when I don”t know for sure what the recipe contains. I have to bypass some recipes that sound really good just because I think it may have too many. Can you cook two of these in the oven at once? Thanks! ;( my 9×13 just shattered in my oven as I poured the mixture in. It wasn’t even fully finished preheating. Enough batter left to try another method. Happy New Year! Thanks for creating delish recipes! These are fabulous! I’m Norwegian and often make the thin pancakes with the same ingredients but to feed a crowd this is soooo much easier. Saves me from standing around cooking and not enjoying my guests. I made this for about 50 kids at a summer camp and it was a hit! Thanks for sharing your wonderful recipe. Ohhh wow.. sooo coool…we just learn new ideas..all the time…thank you guys so much really appreciate the beautiful recipes. . I am not sure why this did not turn out for me. I was so disappointed. I double checked the recipe and could find nothing that I did wrong and yet they were raw in the middle even after baking them longer than the time. the sides and the bottom were getting really brown so did not feel I could bake them longer as they had already baked about 40 minutes. What could I have done wrong. I found that when a recipe totally flops for me it is because my oven is not calibrated correctly. (This normally happens the first couple times I use my new oven after moving!) Check your oven temperature using an oven thermometer and see if the temperature matches your setting. If it doesn’t match, adjust your set oven temperature to make the interior of your oven the right temperature. Write down the “secret settings” for your oven so you don’t forget! Another thing you can do is use the silver insulated Wilton cake pan strips or a wet towel wrapped around the outside of the pan. These methods cool the sides of the pan so the edges don’t overheat and the whole dish bakes more evenly. They should be a bit custard like in the middle. You did not do anything wrong. Just made this AMAZING breakie for brunch today! HUGE SUCCESS!!! My husband said it is THE BEST breakfast he has ever had!! I served the pannukakku with cool whip and homemade blueberry sauceand gooseberry jam. Thank you so much Alyssa for sharing your fam jam recipe!! It was a GRANDE success in my house!! Our tummies are thanking you and can’t wait to try out another one of your recipes!! Use whipped real cream. Cool Whip is for chemical engineers and giant food conglomerates. ALWAYS use butter and cream in Finnish cooking. Thanks so much for this! My father’s grandparents came over from Finland, and I love French toast, custard, and crepes, so excited to try this! My Great Grandmother was Finnish and her husband was Swedish. Pannukkau has always been a favorite in our house. When we have it we add a dollap of Thimble berry Jam on top. Thank you. This was soo delicious! I was a bit skeptical when i put it in the oven, but the results are amazing! It’s like a custard pie! Thanks for sharing! My husband and I are both Finnish and we love to make Pannukkua!! I may have to try out your recipe… we have a different one that works really well but it calls for a whole stick of butter! I might try your recommendation 🙂 Thank! Why can’t one print this recipe for Pannukkau? I’m able to do so on your other recipes. Just a warning to anyone attempting this recipe. When the butter started to bubble up, some of it hit the top of the oven and started to spark and smoke. Luckily I turned it off in time but it was very scary. Keep an eye on it! 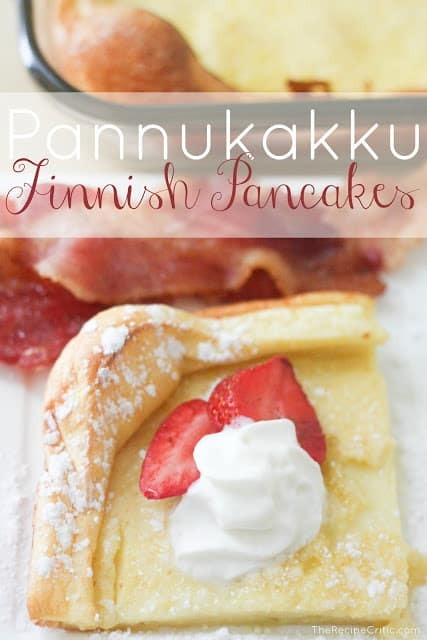 I am Finnish and love this recipe! We have it on special occasions. Thank you! My maiden name was Jauhola. My grandparents migrated from Kemi, Finland in the late 1800s and my grandmother, Anna Niccoli, brought this recipe with her too. The only differences are baking on 425 and a teaspoon of baking powder. Thank you so much for sharing this. My daughter always makes this for her daughter’s birthday too. I have been making Pannukakku for many years. It’s definitely a family tradition and reminds me of home, one of our favorite comfort foods. Unfortunately, I lost my go-to recipe and haven’t been able to find one comparable. This one sounds similar, so I’m going to give it a try. thank you for sharing. When I make them, I add cardamom, cinnamon and nutmeg to give the pannukakku a nice spiced flavor (cardamom is one of my fave spices of all time after years of eating Finnish Coffee bread). I serve them with syrup or lingonberry jam. I make pannu often & my recipe is similar to yours. I appreciate your respect for your husband’s heritage; I am Finn also. Did you notice you left out what to do with the pepper and sugar for the bacon? I just sprinkled it on top before baking. My husband’s mother was from Finland. I made this for my husband for Christmas morning to honor his Mom who is deceased. I used a black iron skillet to cook it. I also added a little vanilla extract and cinnamon to it. It was delicious. My topping was frozen black cherries cooked down with a little brown sugar and maple syrup and thickened with a little cornstarch at the end. Love your recipe!! !